What if your marriage was meant for more than just happily ever after! "Your marriage is God's, and He desires it to be done HIS WAY and for HIS PURPOSES!" Aaron and Jennifer Smith, popular marriage bloggers at HusbandRevolution.com and UnveiledWife.com, transparently share their journey from a marriage in crisis to a marriage built on Christ’s redemptive love. Through fresh biblical insight and intimate stories of their own struggles and victories, this book will guide you toward a God-centered, ministry-minded, and thriving marriage. You will discover the signature marks of a marriage after God, find principles for building an unshakable marriage foundation, learn how to let God’s story take the lead in your love story, and recognize the tools God has already equipped you with for a missional life together. Filled with helpful illustrations, this thorough and practical book will empower you and your spouse to dream, decide, and do as you step hand-in-hand into God’s ultimate purpose for your marriage. Your oneness is also meant for witness. God has purposed your remarkable, romantic, and redemptive relationship to be a powerful light to a dark and hurting world. This is your invitation to marriage as God intended – a life-saving, hope-inspiring, and transforming force of God’s love. "Oneness is one of the greatest ways we show the world the true gospel." 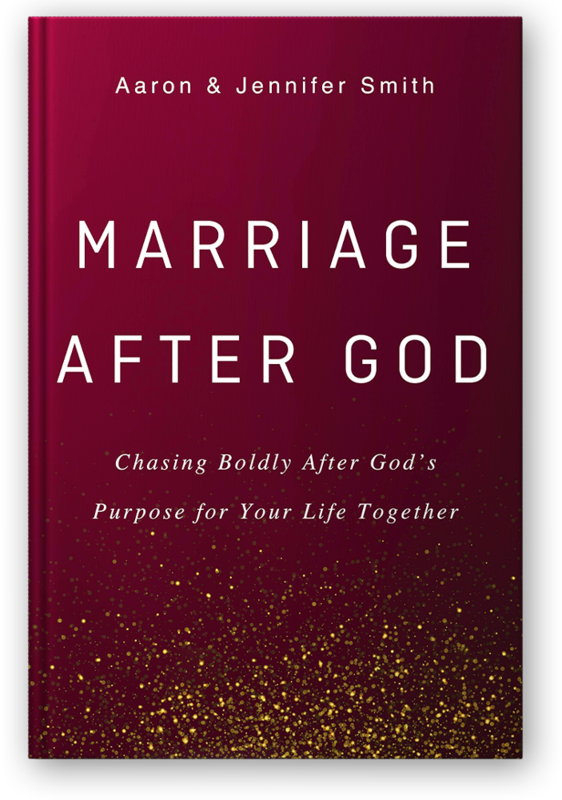 In these pages Aaron and Jen have fantastically conveyed the purpose of the mission and meaning of marriage.. A powerful read that left us both inspired and awed that we get to participate in something so powerful –marriage –designed and created by a mighty God for an amazing adventure. No doubt this will become a must read for decades to come! "This book is an incredible resource for anyone trying to grow or step into a healthier and more life-giving marriage. Aaron and Jen pull no punches and are honest, raw, and authentic and show that a marriage in pursuit of Jesus can change the world." In Marriage After God, Aaron and Jennifer Smith have boiled the complexity of a godly marriage down to its essential nuggets. This book is honest, straightforward, biblical and a great tool for any couple that aims to honor God in the midst of real life. Marriage is hard. We need people who are brave enough to share honestly about the challenges couples face as they try and live out a marriage after God. That’s exactly what Aaron and Jennifer do in this book. They share their story, but even more, they point us back toward the bigger story of God and the truth of his Word. "In Marriage After God, Aaron and Jennifer Smith, have laid out an easy-to-read and easy to follow plan for both husband and wife to work together to create an extraordinary marriage. With their love for one another and for the reader, combined with their signature transparency, this book is a must read for every couple." There is a short list of books I’m stashing away for my three small kiddos to read when they are older—Marriage After God is one of them. Dear couples of the world, you have picked up a treasure! This book will give you clear direction to live out God’s will for your marriage. There is no greater gift you can give yourselves than to run after Him together. Marriage After God will show you how! The Smiths possess a wisdom that has been hard-won as a married couple. I respect them deeply for how they have taken what they've been learning and present it to the rest of us wrapped in so much truth and grace. Marriage After God helps create stronger marriage relationships while urging couples to honor God above all else. It's an amazing resource! Christian marriage is meant to be so much more than a mere “hanging on” or “hanging in there” together. And that’s what I love about Aaron and Jennifer Smith’s book, Marriage After God---how their message calls us back to the Bible and the depth of love God desires for us to enjoy, as well as impact the world around us. Honestly and powerfully written, Marriage After God will inspire you to build the extraordinary marriage He always intended for you. Aaron and Jennifer Smith are among the most powerful, authentic voices speaking biblical truth to today’s generation on the subject of Christian marriage and the life of faith. Marriage After God takes couples far beyond the destination of an excellent marriage and to the very purpose of God in every man and woman He brought together. Grow closer to God and to each other . . . read Marriage After God! Aaron and Jennifer Smith know from experience that a marriage wholeheartedly dedicated to God is a powerful thing. And if couples fight to remain unified, devoted to God and His purposes, the impact of such a bond can be incredibly influential for the kingdom. Prepare your heart to be encouraged and generously equipped as this book will challenge you to not only hear God’s Word, but to trust it, believe it, and put it into action. Every couple should read this book as it will help them discover God’s blueprint for their marriage! In Marriage After God, Aaron and Jen challenge every couple to evaluate if their perspective of their own marriage is founded on God’s purposes by teaching the core elements of biblical marriage and taking inventory of their gifts, talents, and experiences so that they can fulfill the unique purposes God has designed for them. "In a culture confused by too many differing messages, traditional marriage has been brought into question. This important book will give guidance and inspiration for the profound purpose of marriage and the way to pursue a strong partnership that will last a lifetime. The stories shared, compassion in each page and wisdom will inspire all who desire to grow stronger in their marriage. " Marriage After God is a powerful resource of truth that is needed now more than ever. Aaron and Jennifer Smith have done an incredible job of bringing Biblical truths about marriage to a practical application. You will be blessed by their transparency, wisdom, and personal story of God's redeeming power. I can’t wait to see how God uses this book to bring unity, hope, and healing to all who read it! As a young wife I heard a truth that has never left me, "The closer you draw to God, the closer you'll be able to draw to your spouse." Marriage After God is a beautiful testimony to this truth. All good marriages are a journey of trust and making ourselves known to each other. A strong, God-centered marriage can also become a beautiful ministry that can impact the world. I'm thankful for Aaron and Jennifer's message of striving for an extraordinary marriage with God at the center. This book is perfect for couples who want to be stronger together and impact the world in amazing ways! As a thank you for being a Movement starter and preordering Marriage After God We have created these bonuses that you can have completely FREE! No matter where you pre-ordered your copy of Marriage After God you can receive all of the freebies. Simply fill out the form on this page and upload a photo of you together and you will get access to all of the pro-order bonuses. Exclusive Access To A Live Online "Marriage After God Workshop" Hosted By The Authors. Please enter your order number, from what ever online store you purchased your copy of Marriage After God, axeactly as it appears on your receipet. This photo will be used on the Movement Starters page. "A marriage after God says yes to God, even when our flesh screams no!" This is a list of those who have pre-ordered the Marriage After God book and have decided to start a movement of marriages that are chasing boldly after God’s will for the life. Would you consider joining them? Pre-Order Marriage After God Today! A marriage after God for us means we choose to walk in love even when we don't feel like it and we trust each other when God tells one of us to take a step of faith that requires a lot of change for us both, because we know it's Him. A marriage after God is where both spouses are first seeking God, and through seeking God draw closer together. And in them seeking God they are obedient to what God has for them in His plan. A Marriage After God is one in which a husband and wife not only seek unity as a couple, but also unity together with God. It's a marriage that values and pursues the Lord's purpose before personal gain or comfort. It's a marriage that is founded on Truth, built with charity, and led by the Holy Spirit. We have been blessed with 30 years together. It’s by only the grace of God. A marriage after God is intentionally persuing a relationship with God & each others. I am excited to have this resource from a couple who knows the inside struggles that all of us married couples feel and go through together. It is great to have a biblically based resource to read through together as we learn to lean into God more as we work on loving each other more like God loves us! Having a Marriage After God means that you are both fully submitting to Him and His word, allowing Him to protect your marriage. No matter what the circumstances, putting ourselves aside and continually asking, "How can our marrage win?" A marriage after God looks like both people searching after God, which draws them closer to each other. In a marriage after God, both husband and wife are pursing God, both individually and together, and encouraging each other to become all that God created them to be. They desire to represent God's love through their marriage to all who God places in their path with the intention of building His Kingdom. It means that you are putting God above each other. In doing this you can become more like Christ. Because you are becoming more like Christ, you will become closer to each other. A marriage after God means loving God and each other unconditionally with authenticity and humility through togetherness that inspires others to love well and pursue Godliness. Consistently seeking God together, always growing and learning. Putting God first and being examples of what a Godly marriage looks like. Seeking God first so that our marriage is a reflection of His love.